The drug Misoprostol which will be distributed through trained Traditional Birth Attendants in rural communities. Mother's Delivery Kit will provide a value added kit containing essential sterile supplies a woman and her birth attendant need to make childbirth safer and keep more women alive. The kit will include Misoprostol. Usual kits are only prepared to mitigate infection, not postpartum hemorrhage, and include a bundle of cotton wool, one antiseptic soap bar, delivery mat, methylated spirit, two pairs of sterile gloves, two cord clamps, mucus extractor, gauze, scalpel blades, disinfectant, maternity pads, infant receiver, and olive oil. Including Misoprostol will be cost effective because the team has connected directly with manufacturers who supply the drug at a discounted rate. Production and packaging of the kits with Misoprostol will take place at their production factory in Lagos, Nigeria. A medical team with considerable experience will train Traditional Birth Attendants (TBAs) on clean, safe, and hygienic deliveries as well as oh how to administer Misoprostol. 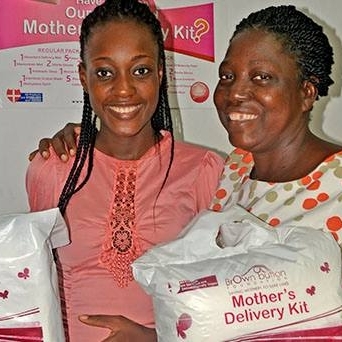 Mother's Delivery Kit has already built a network of TBAs and will reach end users through this network.